Because it would cost hundreds of pounds to catch a train from Oxford to Glasgow we decided to hire a car which worked out much cheaper. Felicity downloaded a GPS navigation app for her iPhone, and it directed us to the centre of town very efficiently. Finding a petrol station didn’t work out quite as well – we spent nearly an hour driving in circles around a complicated one-way street system. We even ended up back on the motorway at one point! Every time we missed a turn it would re-calculate the route and throw us into ever greater confusion. The first day of summer in Scotland was less than impressive – steady rain, howling wind, and a temperature of 6 degrees! After we dropped the car we set off on foot to find our hotel, with our plastic ponchos billowing in the wind. When the street we were looking for wasn’t where we expected it to be, Felicity programmed the destination into her phone and it told her we had 3.7 km to go! Just as we were starting to panic, we realised that this was how far you would have to drive because of the one-way streets. Eventually we resorted to asking at another hotel, and discovered we were only a few hundred metres away. As we neared the hotel, a very large, slightly drunk but very friendly Glaswegian dressed in a T-shirt and jeans took a look at our matching ponchos with bulging packs back and front, and insisted on taking a selfie on his phone. He wasn’t satisfied with the result, and recruited another passer-by to take it so he could have his arms around us. At the rather seedy looking hotel we were informed that Felicity’s credit card had been declined so they had given our room to someone else. All they could offer us was a dormitory, so we decided to check out another hostel down the road instead. This turned out to be a good choice, so we even ate dinner in their bar to avoid going back out into the cold. Today we have been exploring what once used to be the second city of the British Empire. Once an industrial powerhouse, Glasgow became very depressed in the 1970s when shipbuilding became unprofitable, and the banks of the Clyde river are now very quiet, with lots of vacant land where shipyards and factories once stood. 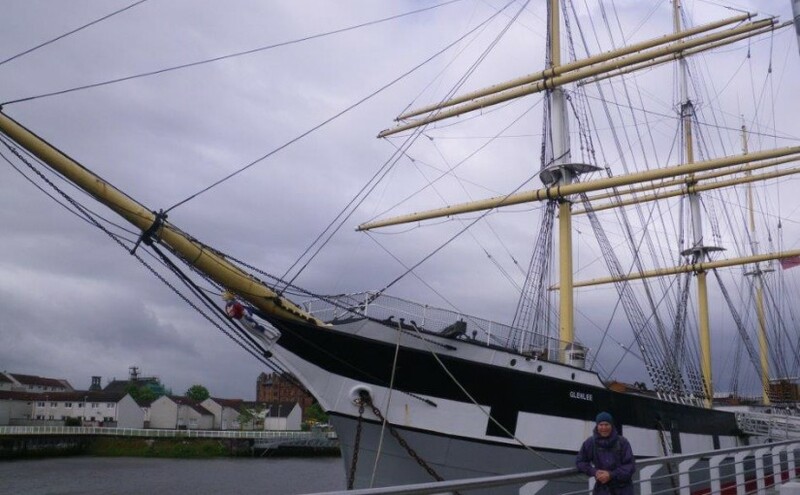 We walked along the riverside pathway and over some of the footbridges, until we came to the tall ship Glenlee – a steel hulled three-masted barque, built in 1896. It turned out to be much more interesting than I expected, and we spent almost an hour exploring it. 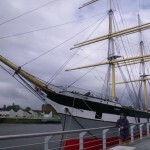 Nearby is the Riverside Museum, and since the weather was still not conducive to enjoying the outdoors, we spent another hour or so checking out the exhibits, which were mainly transport related. There was a big collection of British cars, locomotives, trams and even bicycles. Glasgow was the third city in the world to build an underground railway, and I was interested to learn that it was driven by a cable that the cars hooked on to. Felicity and I were also impressed by a large tandem bicycle built by a young paraplegic woman to cycle across the Himalayas. 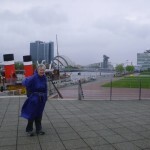 The rain was starting to ease up when we left, so we walked alongside the Kelvin River heading for the Kelvingrove Art Gallery and Museum. We watched some very hardy kayakers (presumably in dry suits) playing on a small waterfall. Following a path through the trees, we were sidetracked by an interesting looking building on a hill to the west side of the river, which turned out to be part of the university. 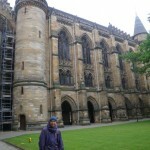 Glasgow University was founded in 1451, and is the fourth oldest in the English speaking world. We wandered around at random for a while, until we stumbled across the Hunterian Museum, which is the oldest in Scotland. William Hunter was actually a drop-out, but he went on to a very successful career as an anatomist and left the university a vast collection of all sorts of interesting objects. So they gave him an honorary degree. 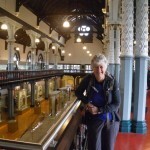 The exhibits were fascinating, as many early scientists studied at Glasgow. But the building was amazing in its own right and would have been worth visiting even if it was empty. 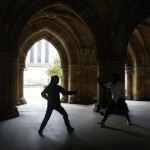 As we walked through the cloisters on the way out, we passed a couple of students fighting a duel with real swords. Since Felicity is officially on holiday, we quickly left before any blood was shed. After a spot of lunch, we finally made it to our destination. We were both a bit museumed-out by this time, but it was still interesting to learn a bit about the history of Glasgow, and see an exhibit about the ancient inhabitants of Scotland. As we walked back into town, the sun almost managed to break through the clouds, and I’m sure I caught a flash of blue sky out of the corner of my eye. 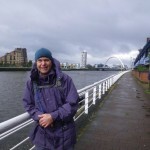 We retrieved our big packs from the hotel and walked up the road to the railway station, where we caught a train out to Milngavie and found our lodgings for the night. We’ve just returned from the village where we enjoyed an excellent meal. 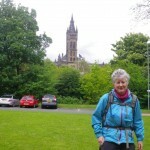 Tomorrow we set off on the West Highland Way. You did well to last so long soaking up the history. There did not seem to be many people braving the cold? Check out Skelmorlie & Largs down to coast from Glasgow. I lived there for a year in the 60’s when Simon was about 4yrs old. Our place overlooked the Isle of Arran. We are heading north/east on foot, so might have to do that another trip.